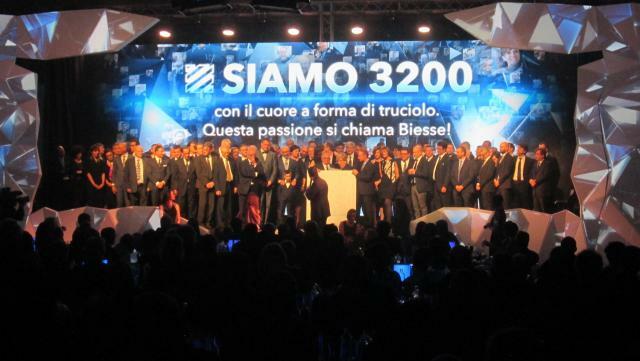 Pesaro, 18 April 2016 – The Biesse Group, Italian manufacturer of machinery for the processing of wood, glass, stone and plastic held a gala evening on 16 April at its premises in Pesaro. Minister for Constitutional Reforms and Relations with Parliament Maria Elena Boschi gave a significant speech, calling Biesse Group a prime example of innovation and Made in Italy, a reference point around the world. Raphael Gualazzi and the group "Neri per Caso" provided the music. Biesse Group: past and future. “Innovation is our driving force". This message greeted the guests inside the factory, where, just a few yards from machinery, the tables were arranged, helping them to immediately relate to the world and spirit of the company and its founder.